Regal and classical, this handsome antique Sultanabad rug is characterized by a vibrant and lively pallet that effectively brings to life the entirety of the composition. Magnificent Large Oversized Red Antique Persian Sultanabad Rug, Persia, circa Turn of the Twentieth Century – This awe inspiring antique Persian Sultanabad rug showcases an outstanding large format all over arabesque design that is full of superfluous floral motifs and evocative details. 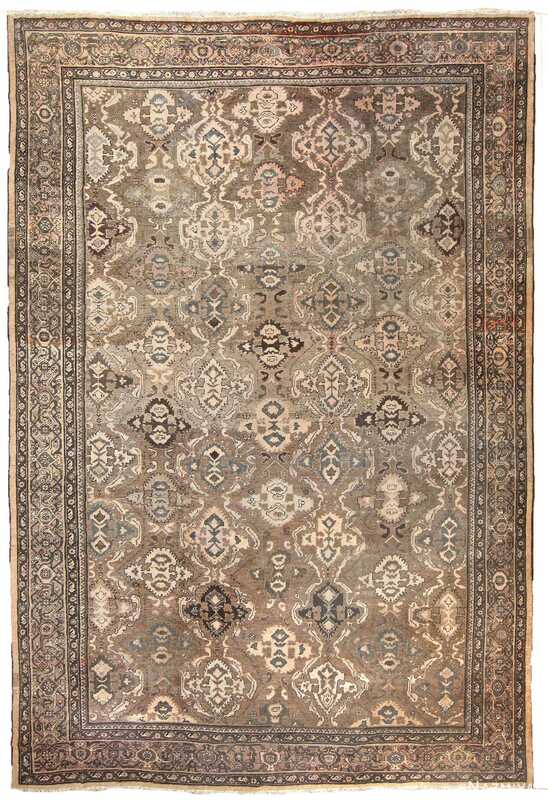 Filamentous outlines rendered in contrasting colors highlight the graceful undulating outlines of the thickened vine scrolls and flourishing botanical motifs. 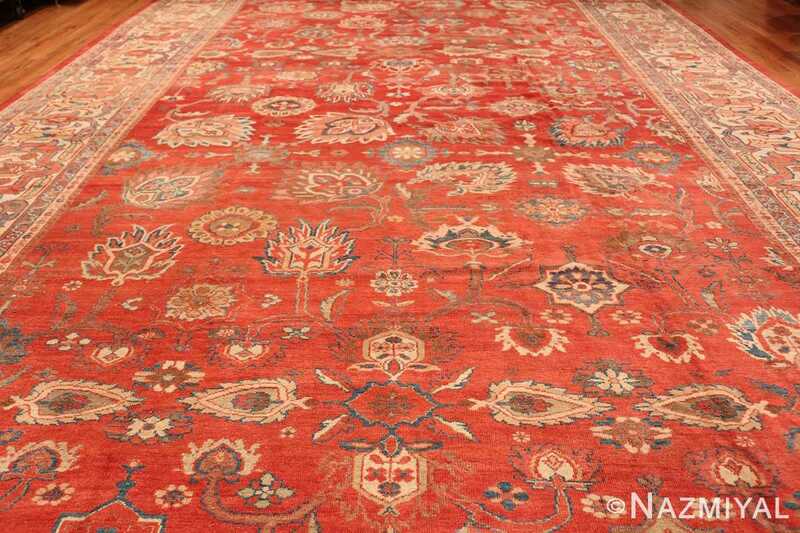 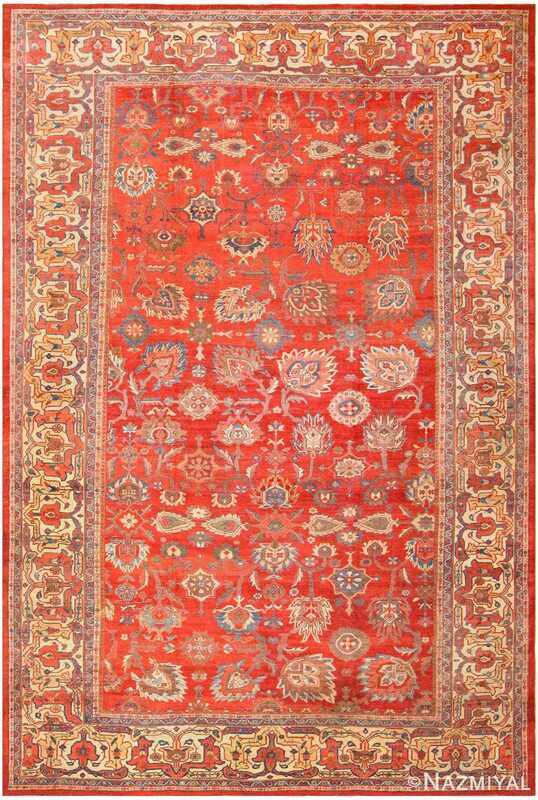 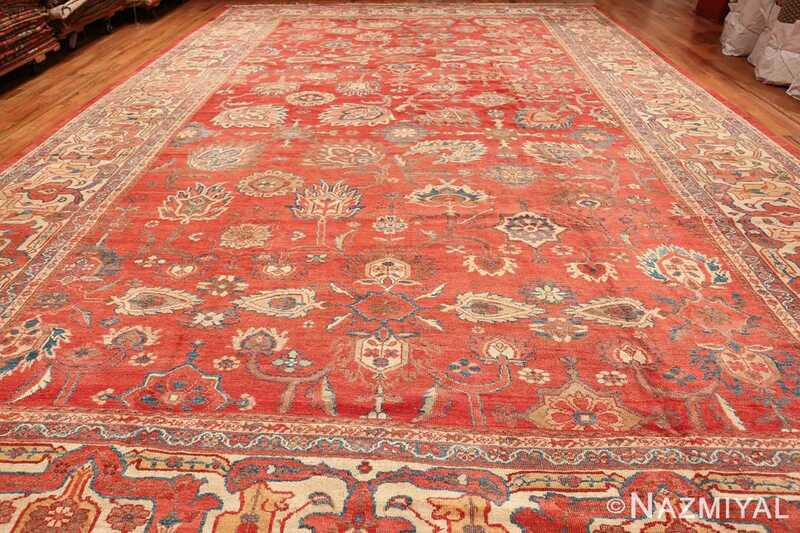 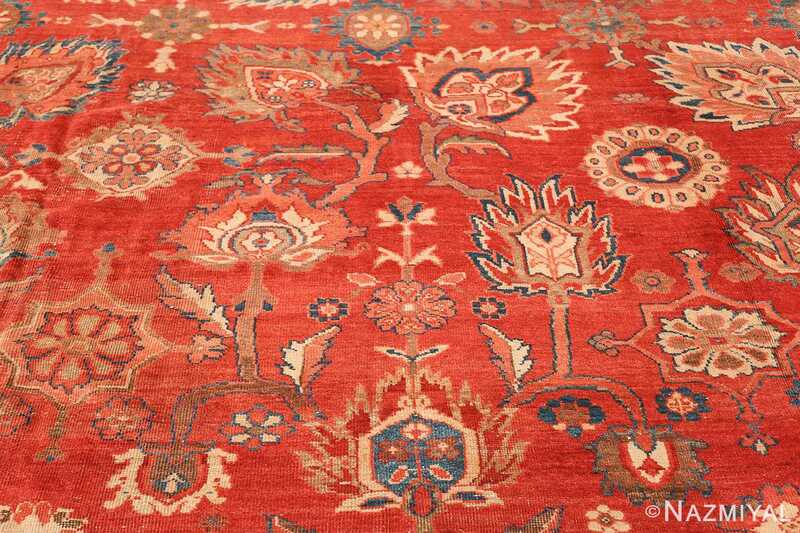 This magnificent antique Persian rug features explosively energetic large scale palmettes which boast unfurling petals and supportive elements with poly chromatic accents. 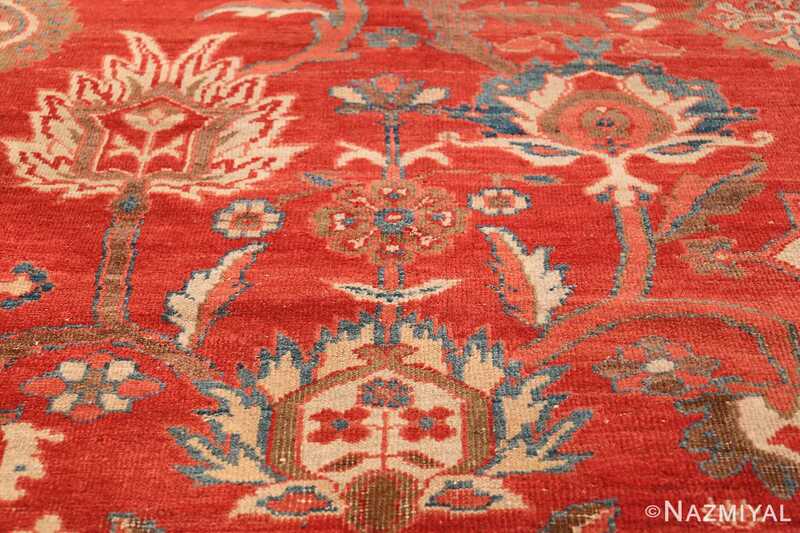 These beautifully rendered patterns create a bold allover arabesque that is set over a superb vibrantly happy red color field. The lighter colored palmettes create a magnificent juxtaposition against the more vibrant red background color. 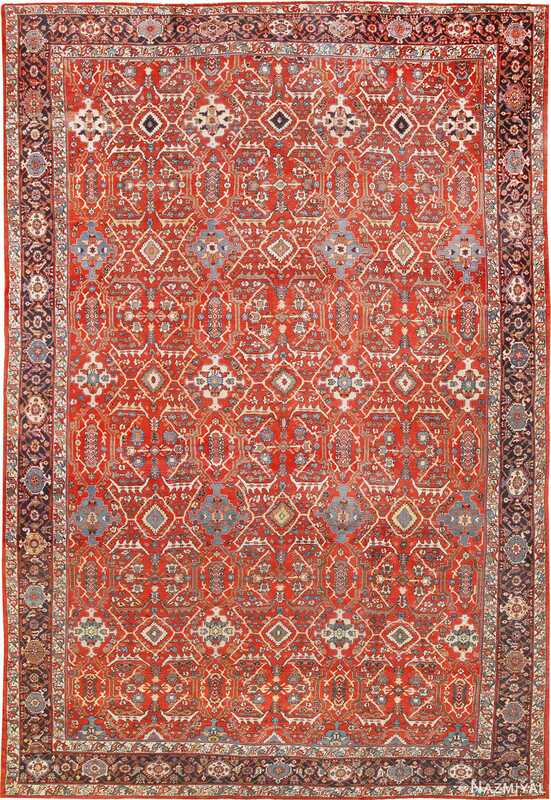 The play of color and pattern combine in the most harmonious way to create this magnificent jewel tone rug. 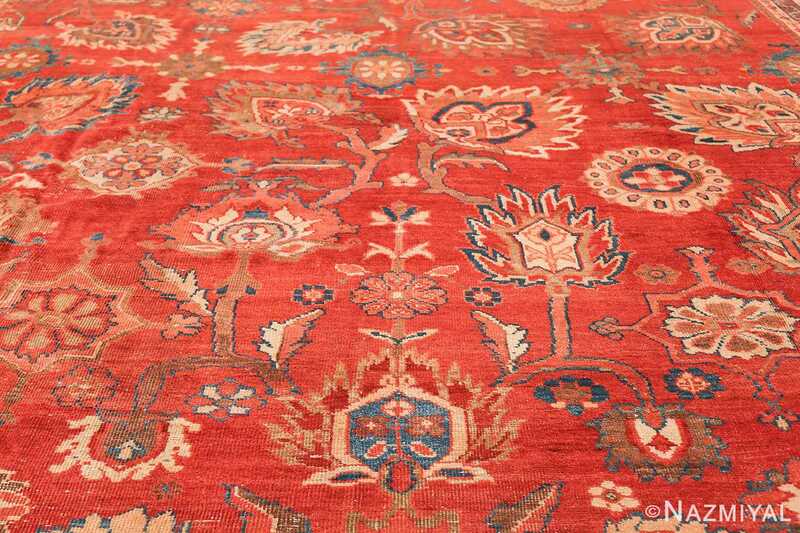 Taking the area’s flamboyant style one step further, the stately main borders depict an array of grand botanical motifs arranged in a beautiful reciprocating pattern. 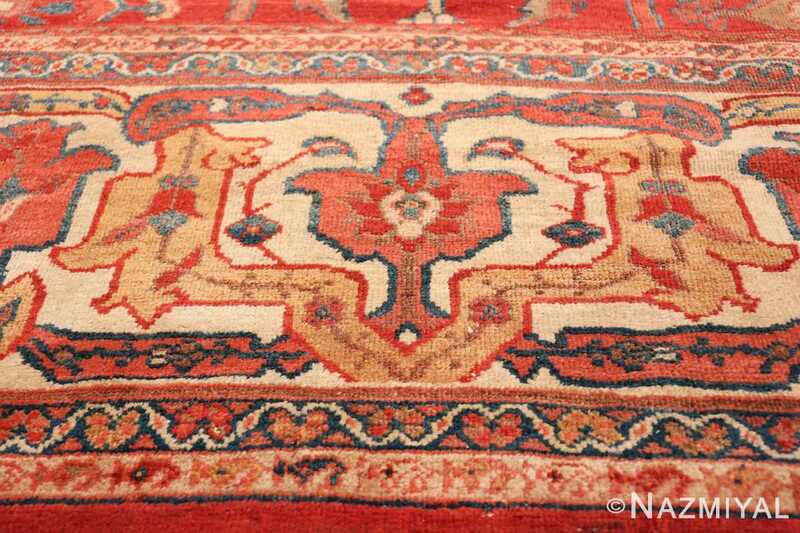 The design traditions of greater Persia are represented in the delicate guard bands that feature ornate floral motifs, which produce exceptional minor borders. 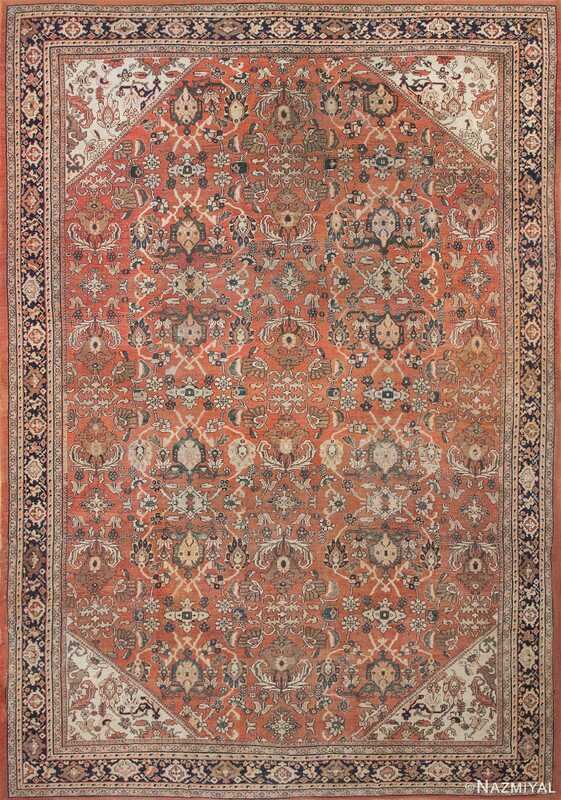 The wide encompassing ivory background border plays off the colors and patterns of the field. This play can be seen in both the design patterns as well as in the geometric approach to many of the vine scrolls. 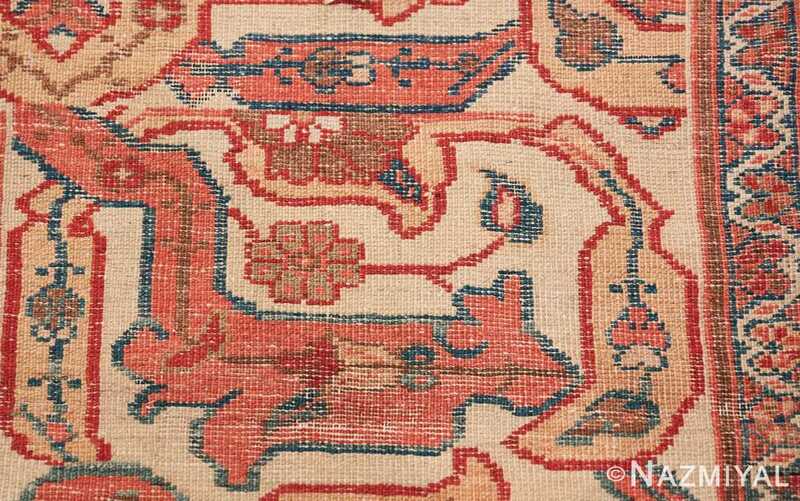 The end result is a such a beautifully put together border that is simply the most perfect compliment to the overall artistry of this large antique Persian Sultanabad carpet. 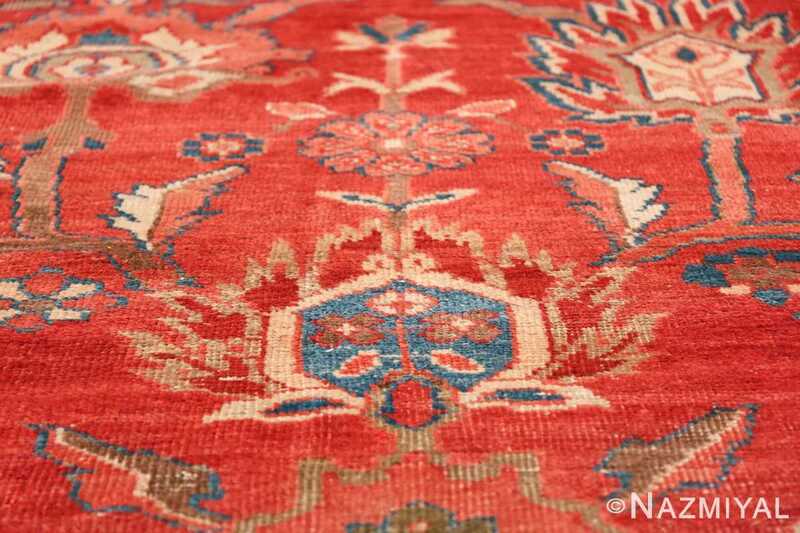 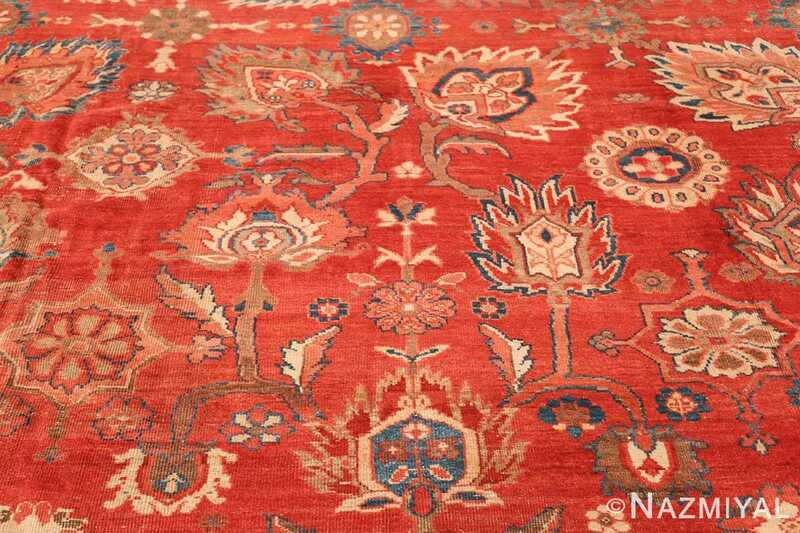 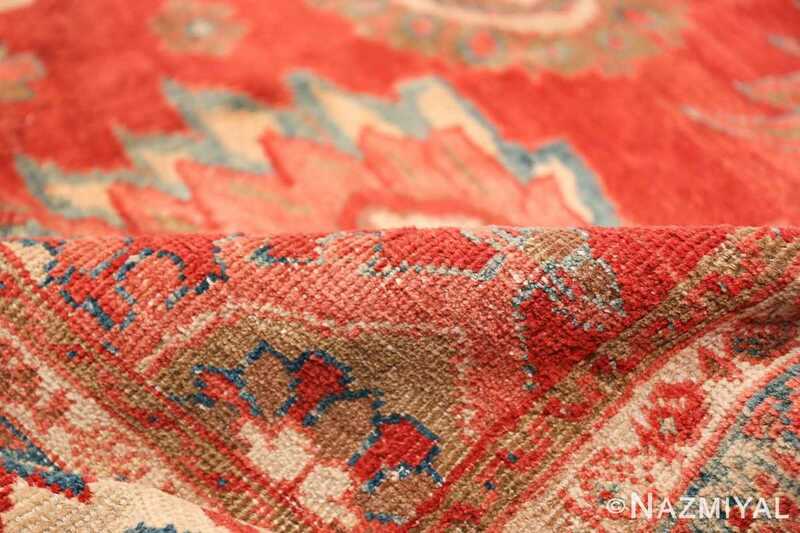 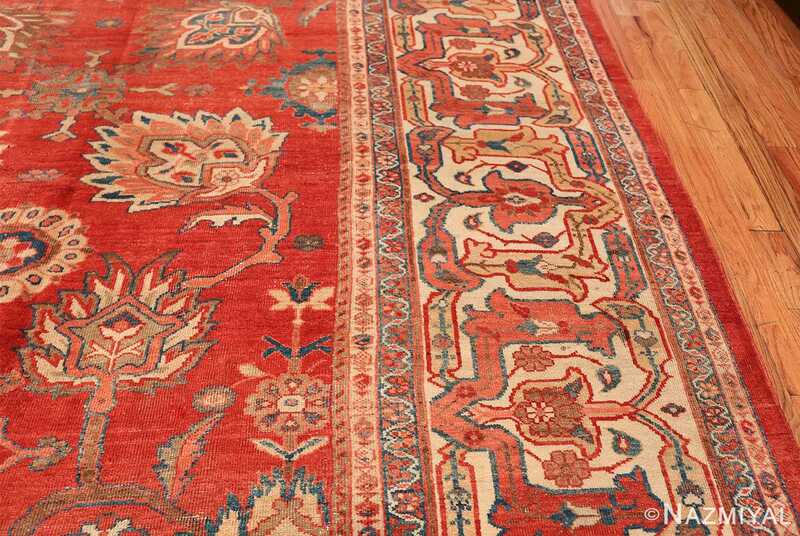 One does not need to be a great maven if antique rugs to see just how spectacular this piece is. 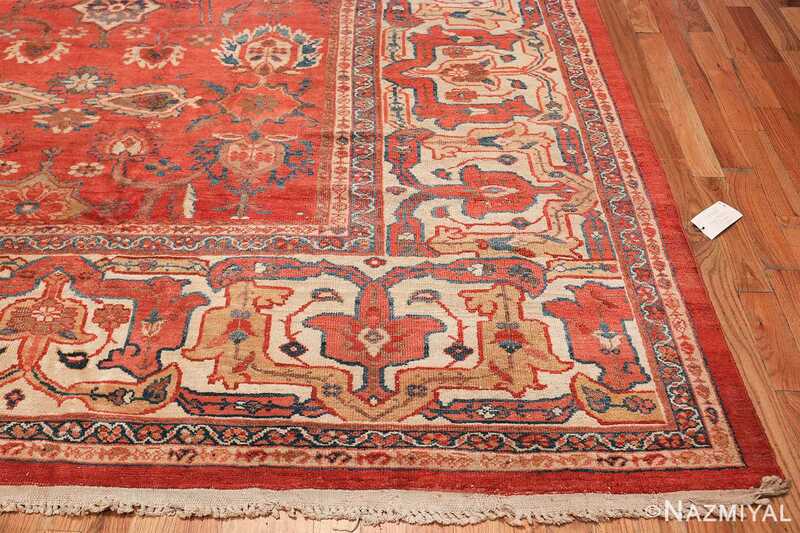 It would be hard to find a better example for those people who love bright happy colors and have the space to fit this magnificent antique Sultanabad. 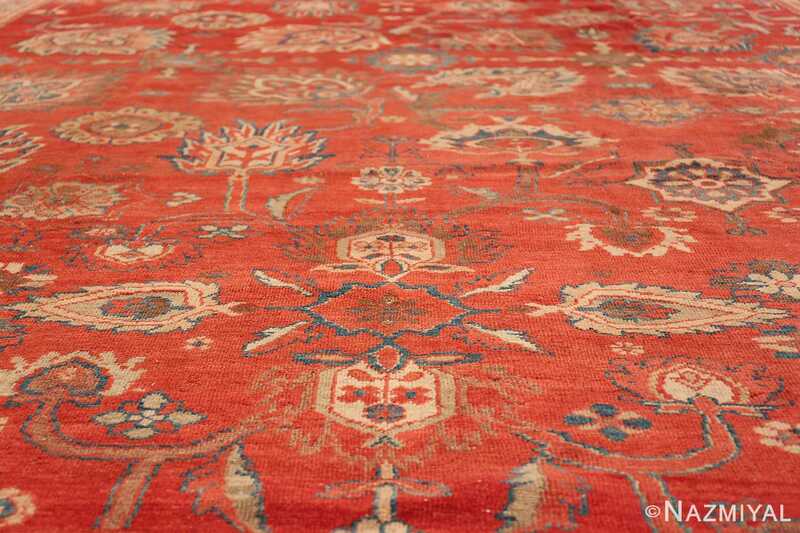 It is, without a doubt, one of the most impressive and breathtaking examples of its kind.